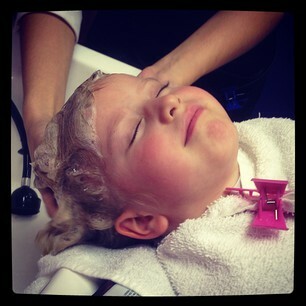 Yesterday, Elisabeth and I had "Girl Day" while Jonah and Daddy had (you guessed it) "Boy Day." I surprised Elisabeth by taking her to see a short production of Rapunzel, Rapunzel A Very Hairy Fairy Tale at the Memorial Auditorium downtown. She really enjoyed it. She has been asking for a haircut for weeks, so, after lunch at McDonald's (her choice), we went to SnipIts in Brier Creek. The wait was horrendously long, nearly an hour (take a lesson from me and don't go on the weekend!) She was looking forward to it so much and knew today was the day so I stuck it out. 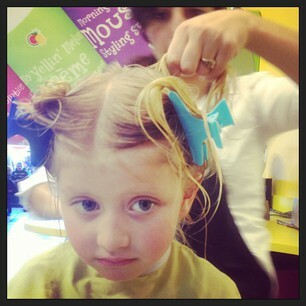 Finally, it was our turn and we talked to the hairdresser about what we wanted done. Elisabeth has been wanting short hair like some of the girls in her ballet class. In further support of her position, at the end of the performance we just watched, Rapunzel's hair was cut to a short, shiny, blond bob. So any preference I may have had to keeping it long was totally overwhelmed by all of that plus the realization that it has been very difficult to brush and care for lately. 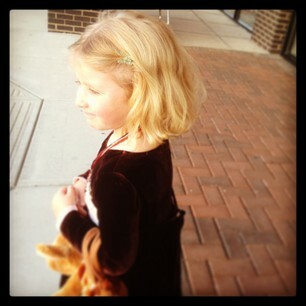 Thus, I acquiesced and we went for short with the caveat that it still be long enough to put in a ponytail for ballet. Our stylist was Anan. She was great! 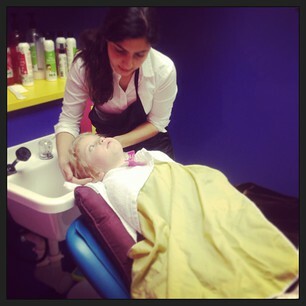 During the shampoo she kept asking Elisabeth if she was comfortable and gave her a 5-10 minute scalp massage. I wanted a shampoo and cut after that! 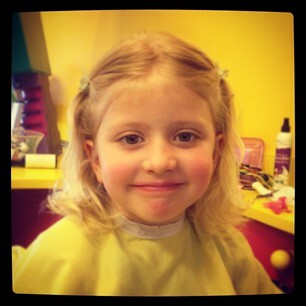 Anan took her time and really gave Elisabeth an adorable cut. It is hard to see in the picture but it has quite a bit of curl in the back and looks adorable. I was very pleased with the cut and felt like Anan had us leave on a high note despite the long wait. 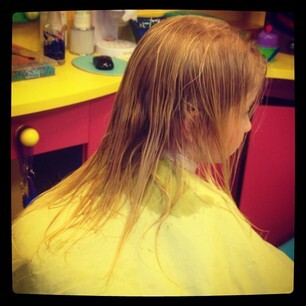 If you have a little girl who is due for a haircut I highly recommend her.